Moist. Stream banks, river banks, disturbed sites. Full to partial sun. 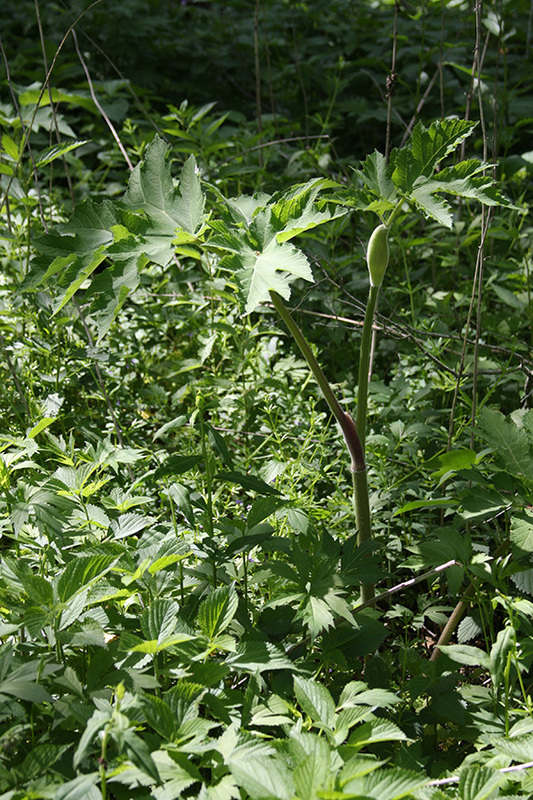 This is an erect, perennial forb that rises on a single stem from a stout taproot. It is usually 3′ to 10′ tall but can be a little taller. The foliage has a foul smell. 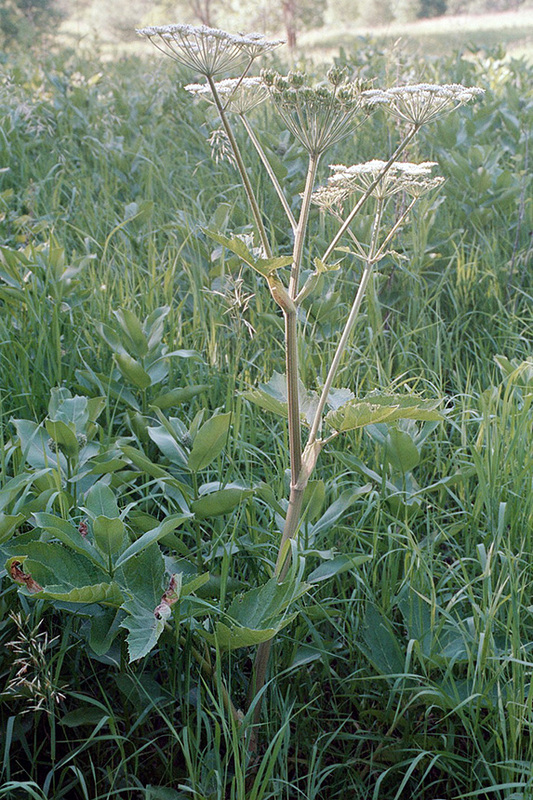 The stems are erect, stout, unbranched below the inflorescence, round in cross section, hollow, and grooved. They are sparsely to densely covered with spreading, easily visible hairs. 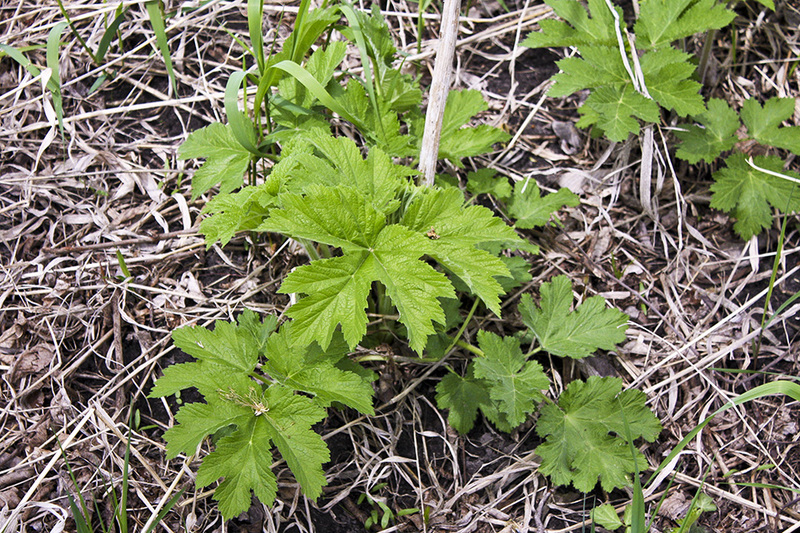 The leaves are alternate, 4″ to 19″ long, and palmately divided into 3 leaflets. 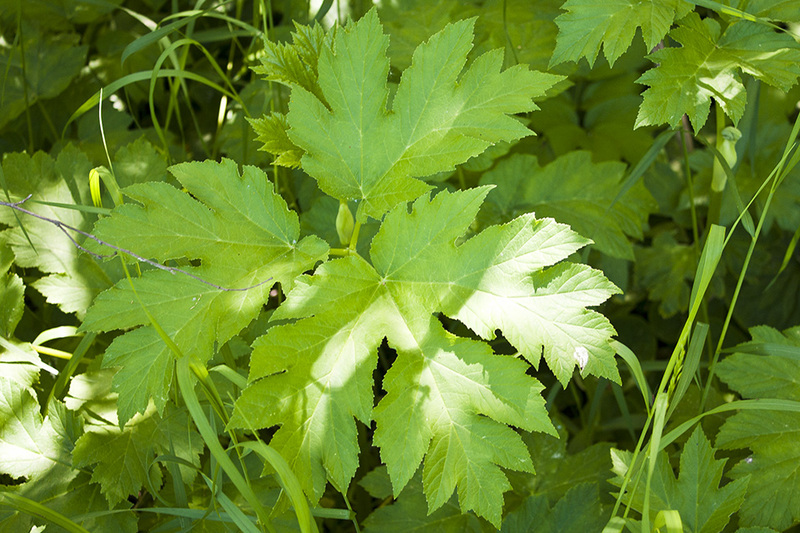 The uppermost leaves are sometimes only about 2¾″ long and 3-lobed, not compound. The lower leaves are on long leaf stalks. 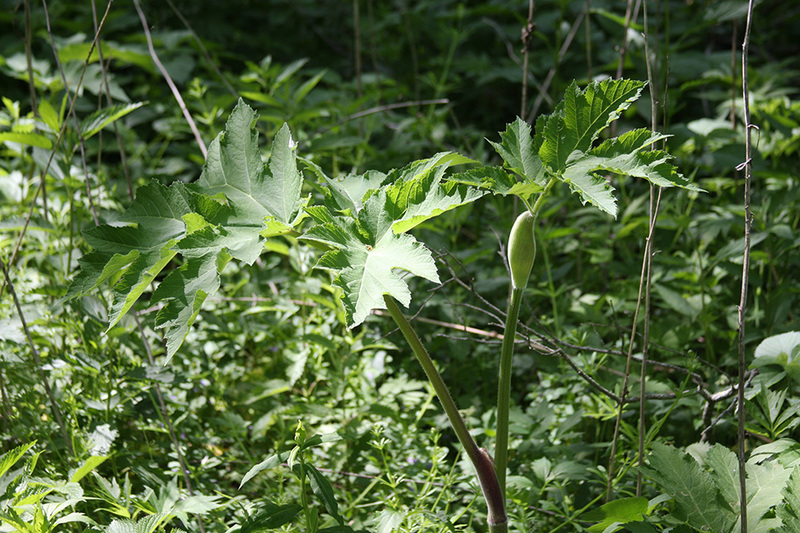 The leaf stalks become shorter as they ascend the stem, with upper leaves appearing almost stalkless. 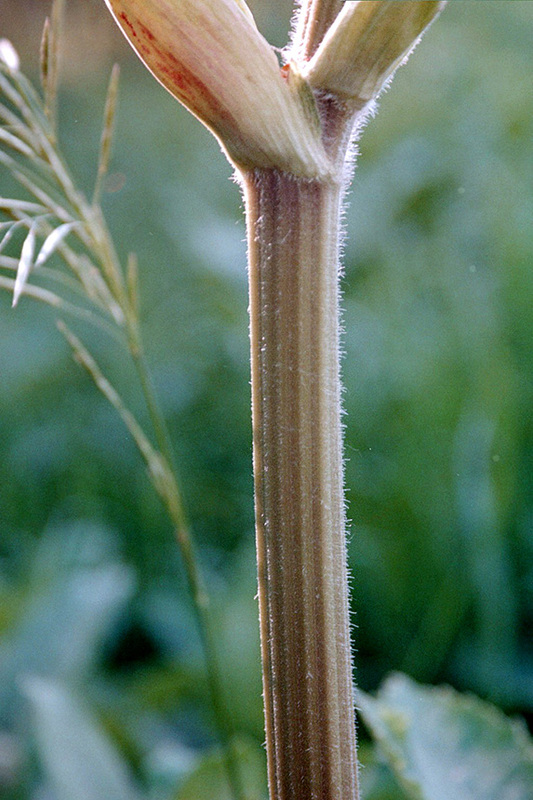 The base of the leaf stalk sheathes the stem. The sheath of the middle and upper leaves is moderately to strongly inflated and moderately to densely covered with spreading hairs. The leaflets are 4″ to 12″ long and wide, egg-shaped to almost circular in outline, palmately 3-lobed, and stalked. The lobes are shallowly to deeply and taper to a sharp, abrupt point at the tip. The lateral leaflets are narrower than the terminal leaflet and are often asymmetrical. The upper surface is hairless. The lower surface is covered with spreading hairs, especially along the main veins and near the base. The margins are coarsely toothed. 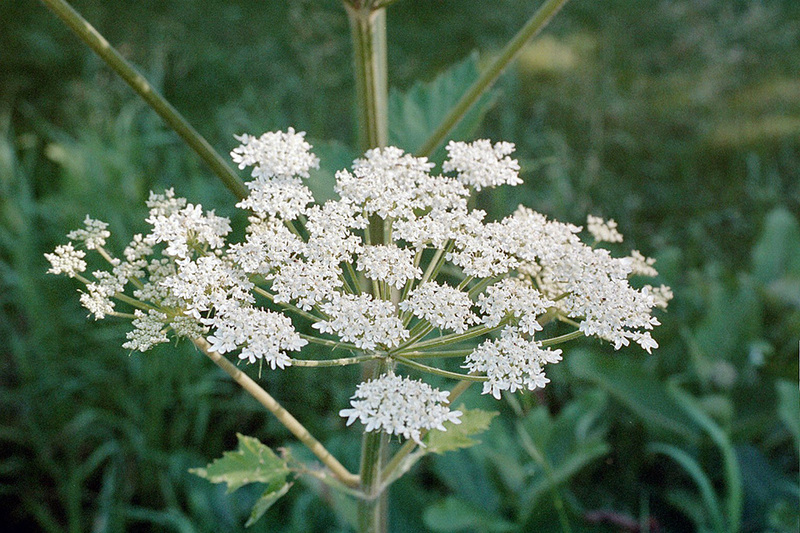 The inflorescence is a broad, flat-topped, terminal umbel at the end of the stem and smaller umbels rising from the upper leaf axils. 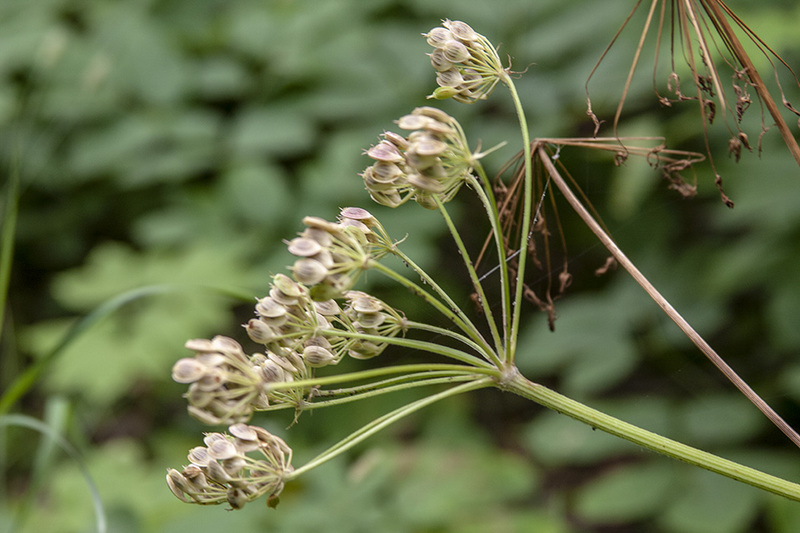 The terminal umbel is round, long-stalked, and usually 4″ to 12″ but up to 16″ in diameter. It is composed of usually 15 to 30 but up to 45 umbellets. The flowers have 5 white, notched petals. The outer flowers of the marginal umbellets are irregular, the outer petals enlarged and often cleft into two deep lobes at the tip. The flowers are fragrant. The fruit is dry, ⅓″ to ¾″long, egg-shaped to globular, and 3-angled. It is tan to straw-colored and has prominent, purple stripes (oil tubes) between the ribs. 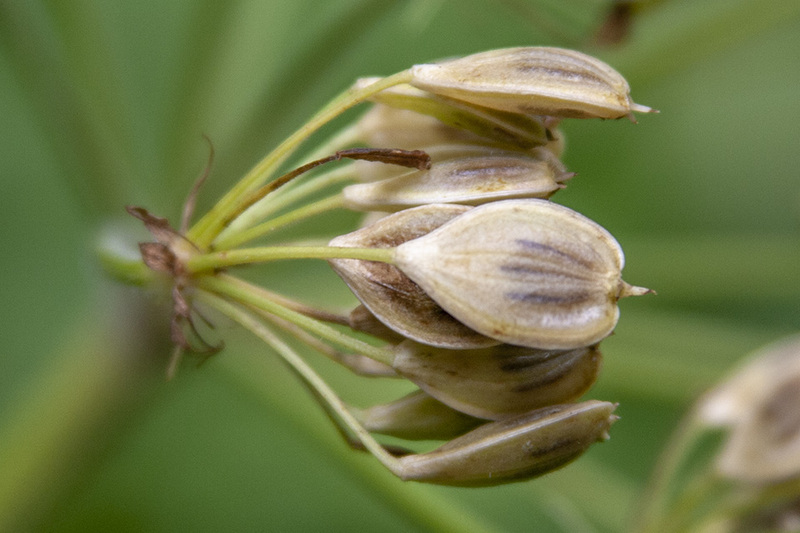 It contains 2 seeds. 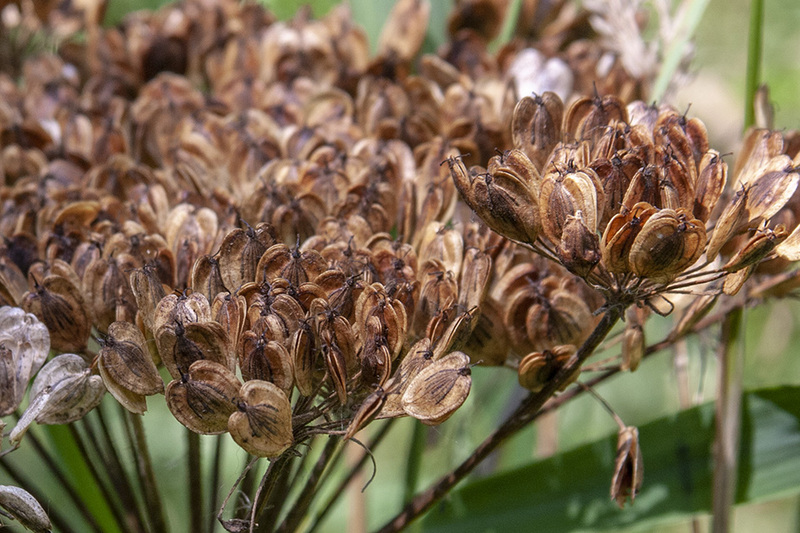 The seeds are flattened on one side, rounded on the other. When ripe the fruit splits into 2 one-seeded segments. Purple-stem angelica (Angelica atropurpurea) stem is hairless. The sheath at the base of the leaf stalk is not inflated or are only slightly inflated. 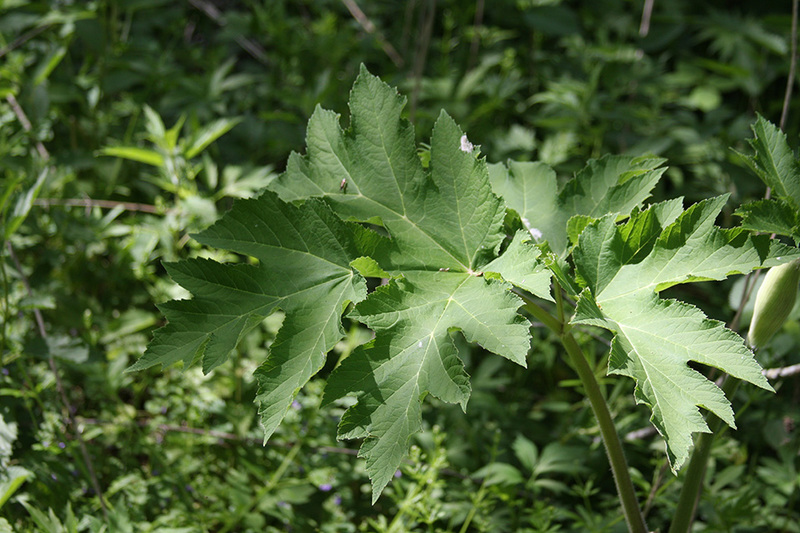 The leaves are ternately compound then pinnately compound with 5 or 7 leaflets. The leaflets are 4″ to 12″ long and wide, egg-shaped to almost circular in outline, and palmately 3-lobed. 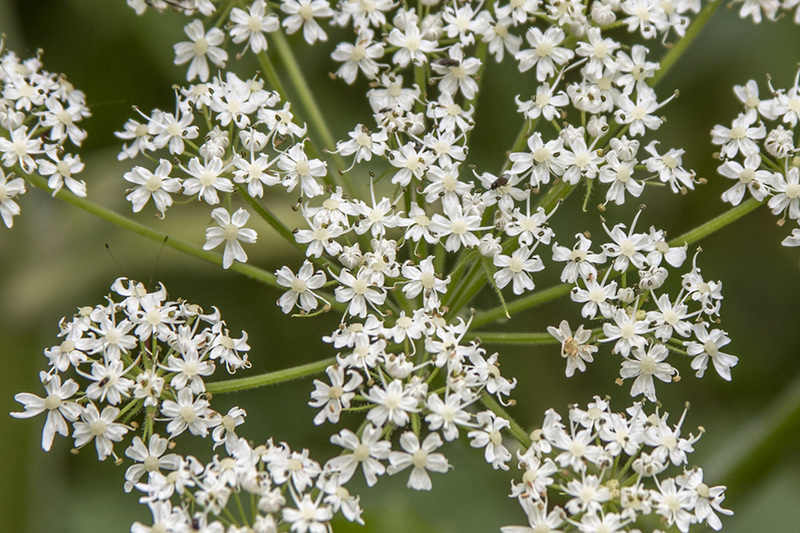 The umbels are globular, not flat-topped. 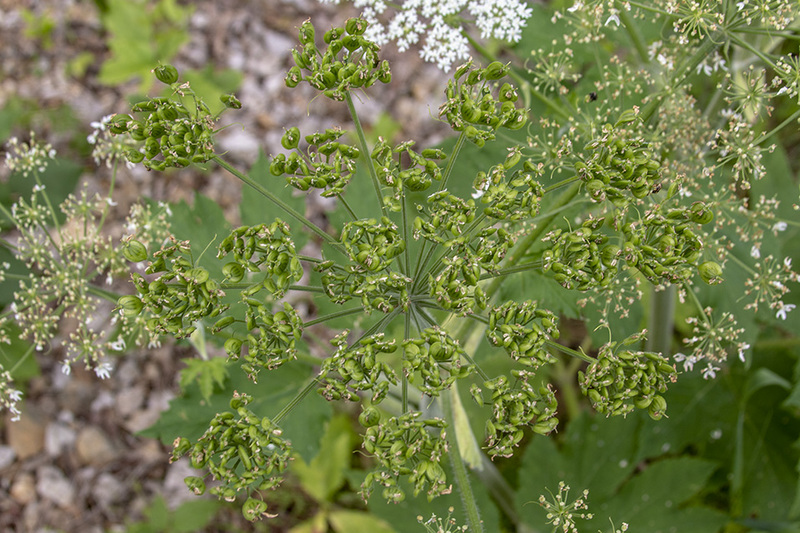 Heracleum sphondylium, common names Common Hogweed or Cow parsnip, is a herbaceous perennial or biennial plant of the family Apiaceae. 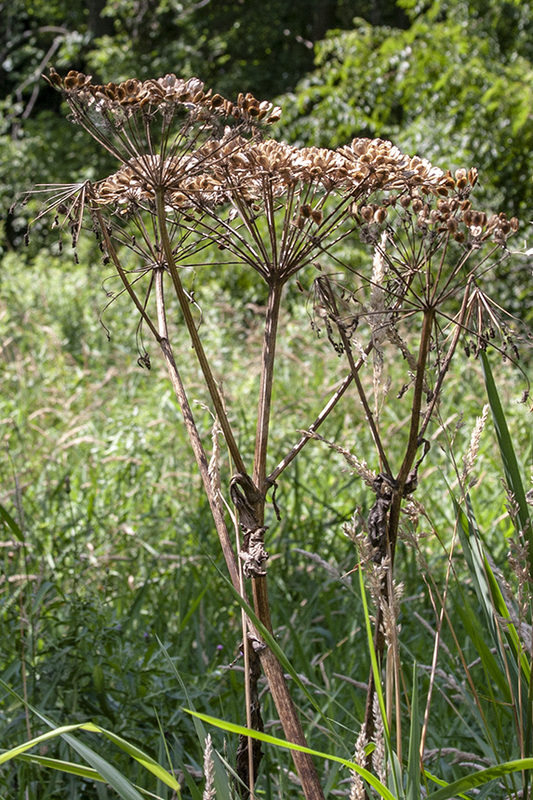 De gewone berenklauw (Heracleum sphondylium) behoort tot de schermbloemenfamilie (Umbelliferae of Apiaceae). 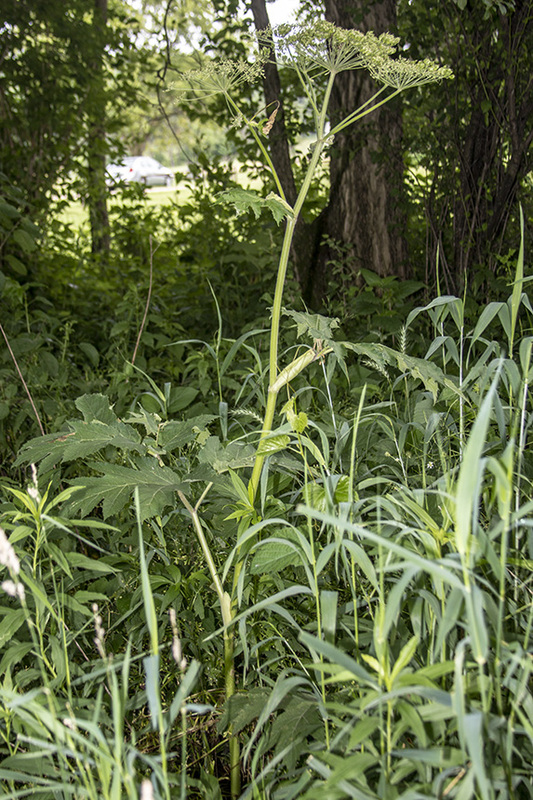 UTRCA staff removing Giant Hogweed on behalf of the City of London. 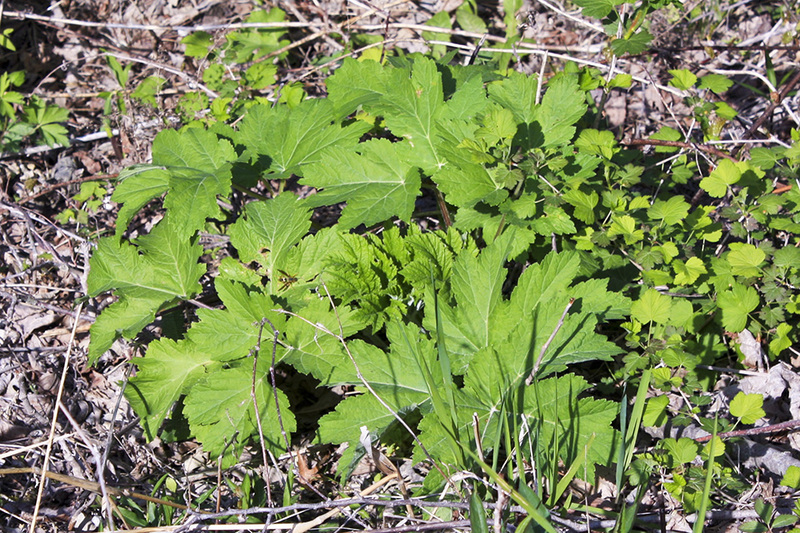 This non-native, invasive plant is spreading very quickly along rivers and streams. 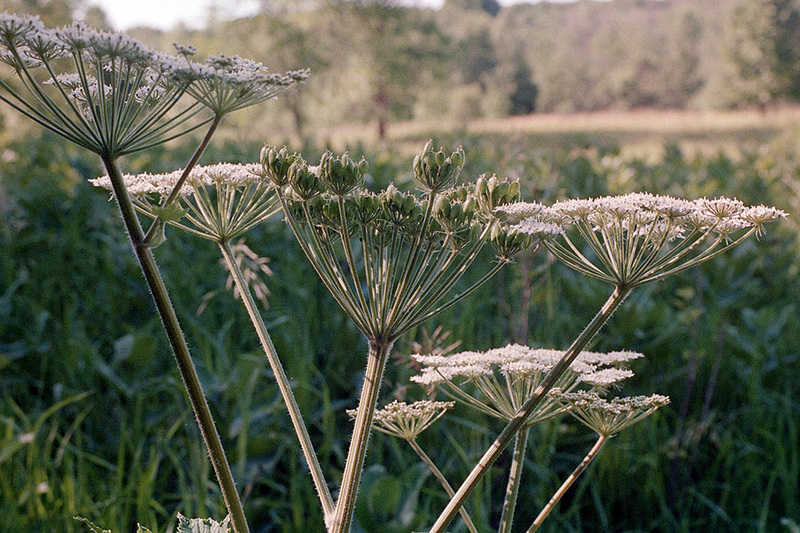 Giant Hogweed is a serious health hazard for humans. Its clear, watery sap contains toxins that can cause severe inflammation of the skin. You can get severe burns if you get the sap on your skin and the skin is then exposed to sunlight, as UV radiation activates compounds in the sap. Video Footage by Alisha Tobola. Click to tweet: http://clicktotweet.com/9b0Ks . Right, some explanation here is in order. 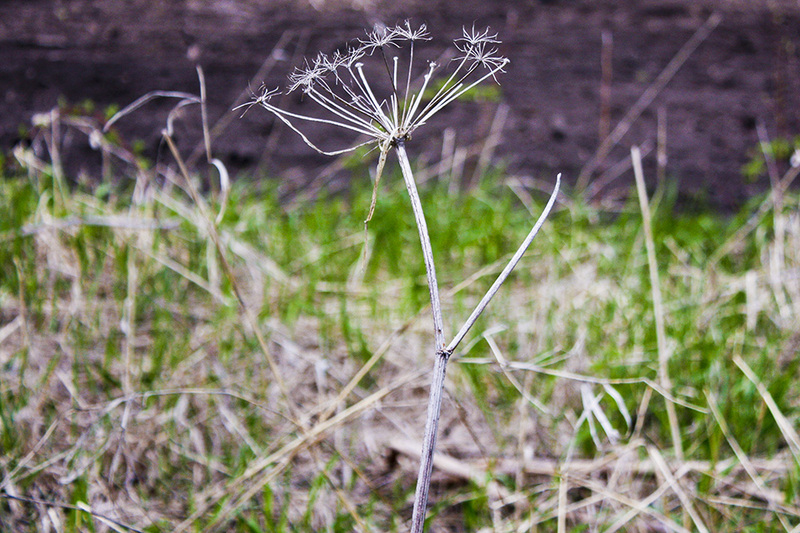 This is A hogweed. 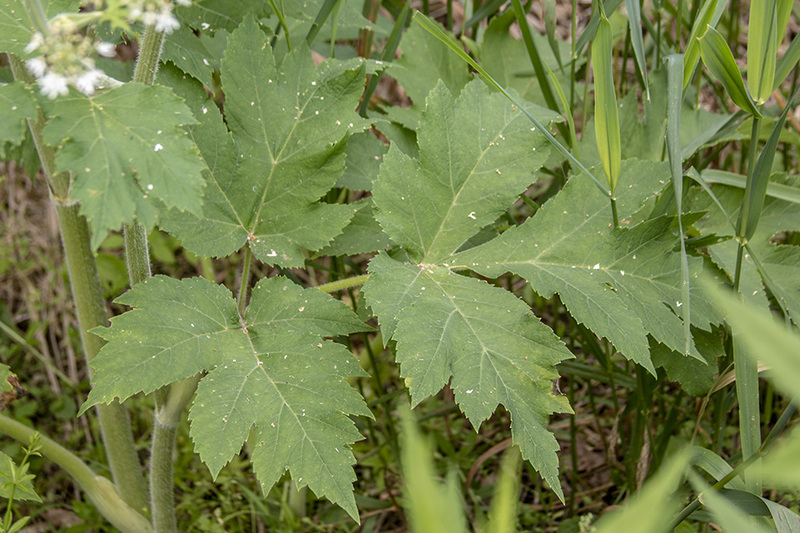 It may not be giant hogweed - Heracleum mantegazzianum - but common hogweed - Heracleum sphondylium - but i wouldn't want to risk finding out by touching it or eating it. 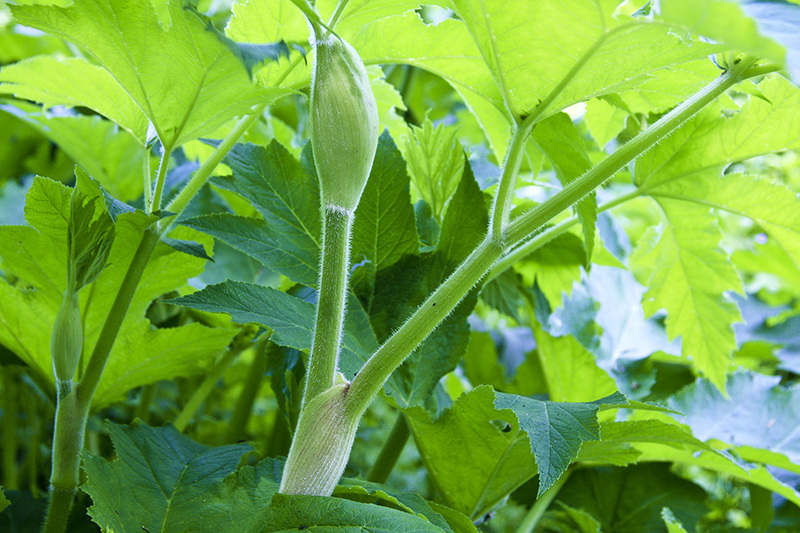 I suspect it's just a young specimen of giant hogweed which hasn't been destroyed yet. 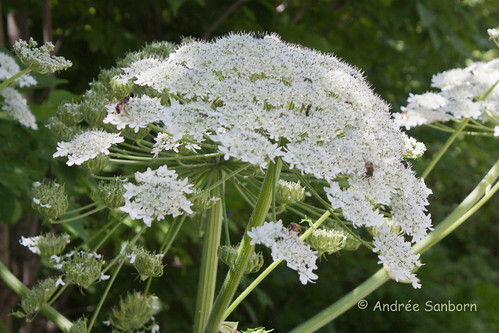 Giant hogweed is an umbelliferous plant native to the Caucasus which is an invasive weed in Europe and North America. The problem with it, healthwise, is that its sap causes severe blistering on the skin if it lands on it and the skin is exposed to daylight without it being removed. It can also cause blindness if it gets into the eyes. 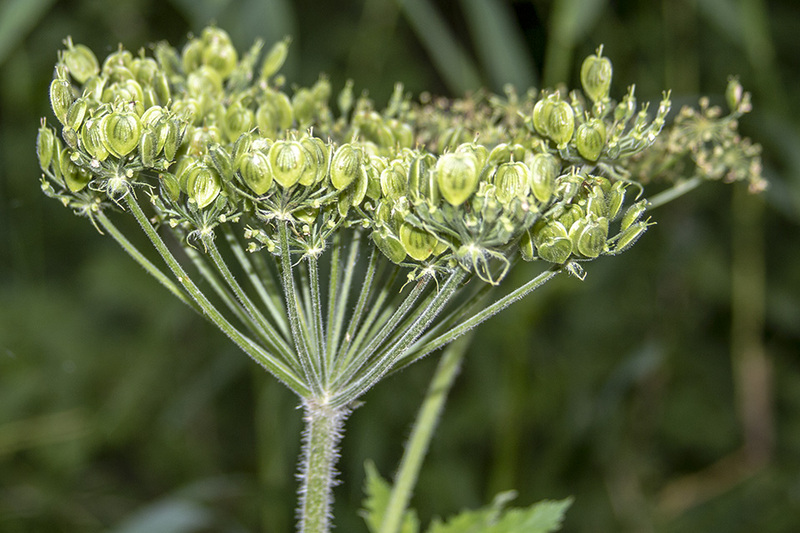 This is because, like many other umbellifers (also known as apiaceae), it contains psoralen, a chemical which causes DNA to break down in the presence of ultraviolet light. It's also, unsurprisingly, carcinogenic and a mutagen. 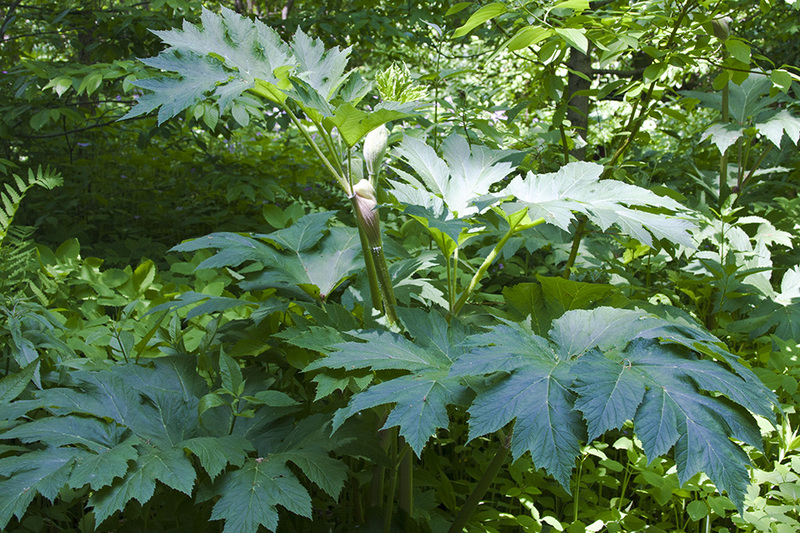 I have personally experienced blistering from giant hogweed sap. It caused a huge blister to appear on my hand which faded to a dark brown stain which lasted two or three years. I still have a scar, which i show in the video, but it's probably only visible to me. The same happened to various friends of mine. 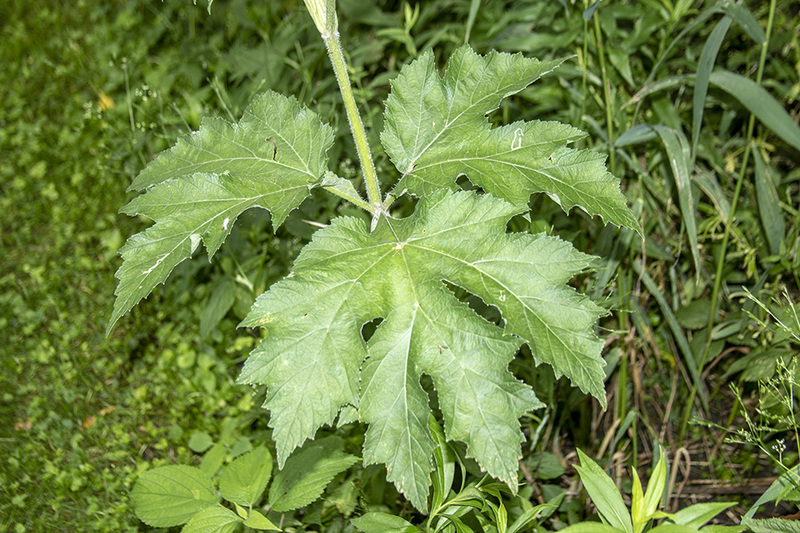 If you come into contact with giant hogweed sap, you should wash the area thoroughly with soap and water and avoid exposing it to light for three or four days. 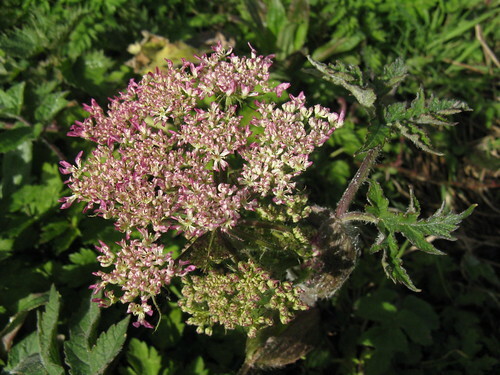 However, psoralens are widespread in the apiaceae/umbelliferae, including celery, parsley, parsnips and fennel, and they have a therapeutic aspect in the treatment of the skin diseases psoriasis and eczema. However, they do also increase the risk of skin cancer. 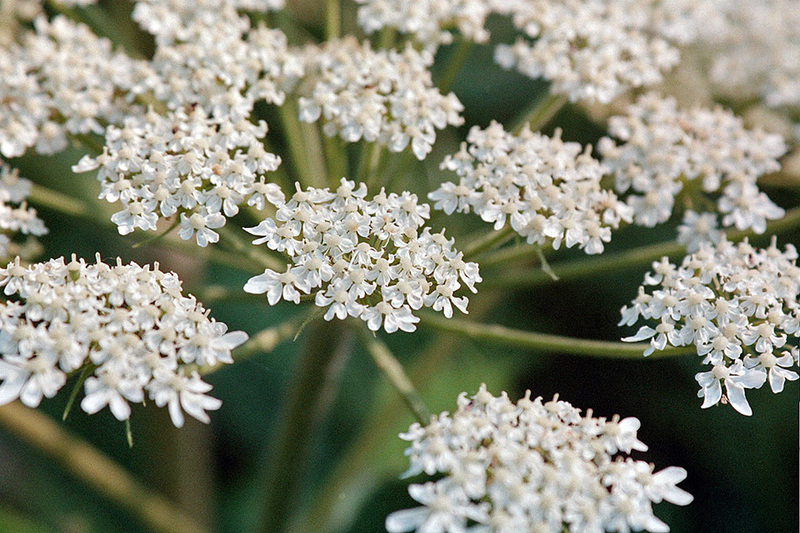 The treatment involving them is referred to as PUVA - Psoralen Ultra Violet A.
Oddly, although hogweed is dangerous, common hogweed at least is edible. I personally wouldn't want to risk it. 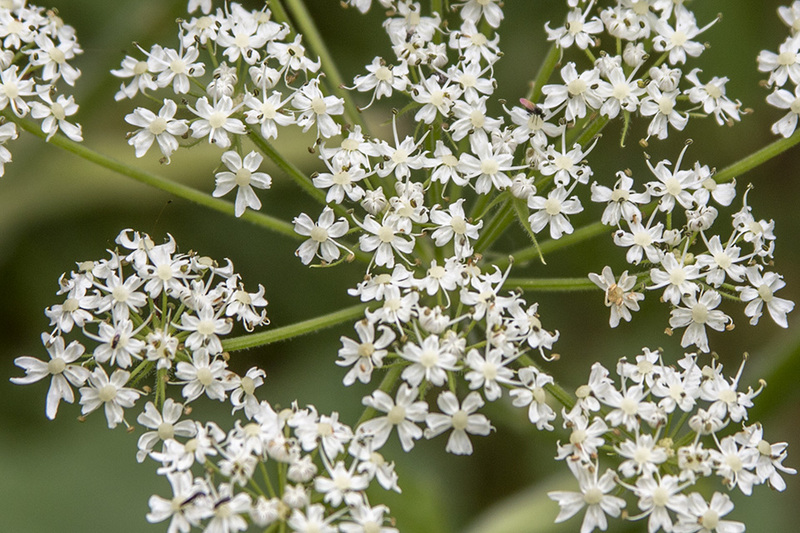 I'm currently wondering, though, if it's unfamiliarity with hogweed which has led to the fear current in North America, because poison ivy and a whole load of other species seem pretty dangerous to me. It's a risk, to be sure, but i walked about eight miles last weekend through several thickets of the stuff and was just careful not to let my skin come in contact with it.